The Nortel BCM 450 Expansion Cabinet with Universal Power Supply is a cost-effective way to increase the capacity of the Business Communications Manager (BCM). Connection is via a DS256 Cable directly from the Media Services Card to the Expansion Cabinet. The Expansion Cabinet is Backwards-Compatible with earlier BCM Releases. It also contains a Cooling Fan, a Power Supply, and a Hub Card. Includes 5m cord for connecting to BCM with Universal Power Supply (UPS). Note: Does NOT support DTI or DDIM Media Bay Modules. 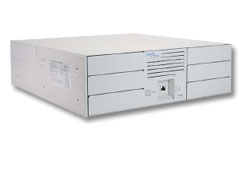 The Nortel BCM 450 can be expanded in numerous ways with Nortel Media Bay Modules and Expansion Cabinets . If you would like to purchase or discuss the Nortel BCM Expansion Cabinets for Nortel BCM 450 in greater detail then please contact us TOLL FREE at 1-855-929-9199 as we will only be too happy to help. The BCM 450 Expansion Cabinet with Universal Power Supply is a cost-effective way to increase the capacity of the Business Communications Manager (BCM). Connection is via a DS256 Cable directly from the Media Services Card to the Expansion Cabinet. The Expansion Cabinet is Backwards-Compatible with earlier BCM Releases. It also contains a Cooling Fan, a Power Supply, and a Hub Card. Includes 5m cord for connecting to BCM with Universal Power Supply (UPS). Note: Does NOT support DTI or DDIM Media Bay Modules.